I imagine that a long and enduring conversation develops with the person who becomes the object of one’s utmost adoration and admiration. When that person is sitting in front of you this conversation takes the form of an external dialog, but when he or she is absent it takes an internal form. Over the last six years or so, I have been having such a conversation, sometimes external and sometimes internal, with Professor Jamal Nazrul Islam. The setting for getting to know Professor Islam and his wife Suraiya Islam was Clare Hall, one of the many colleges of the University of Cambridge, over the course of their frequent visits of varying lengths to that place. By profession Professor Islam is a theoretical physicist. He was a student at Trinity College, Cambridge, where he finished the Mathematical Tripos. (The Tripos derives its name from the three-legged stools that the examinees at Cambridge in historical times had to sit upon while taking their exams. The Mathematical Tripos happens to be the oldest surviving exam in the world and has the reputation for being also the most difficult in mathematics.) After completing the final part of the Tripos (known as Part III) with distinction, Jamal Islam became a Ph.D. student at the Department of Applied Mathematics and Theoretical Physics, or DAMTP as it is often referred to, under the Faculty of Mathematics of the University of Cambridge. After his Ph.D. his career as a researcher and a teacher has taken him to various distinguished places such as Maryland, Caltech, Princeton, ICTP, Cambridge, The City University of London etc. In the eighties he came to Chittagong University and founded there the Research Centre for Mathematical and Physical Sciences (RCMPS) of which he is now the director. Although he started his career working on quantum field theory, he has worked on many different branches of theoretical physics and sometimes even outside physics. Rather than presenting that long list of topics I think that it’s more compelling to say a few words on one of his most important contributions to the field of cosmology. In the sixties and the seventies, the field of cosmology went through a resurgence and witnessed many important discoveries. Cosmology is the branch of theoretical physics which deals with the birth, evolution and the future of the universe. Naturally, this field stands upon the important discoveries and theories in all the different branches of theoretical physics; This is so because the universe is a dynamical and complicated physical system and results from different branches of physics become relevant in describing the different stages of the evolution of the universe. For example, important results from elementary particle physics, stellar astrophysics, the physics of many body systems, black hole physics, etc. are called upon for an accurate description of this complex physical system that we call the universe. 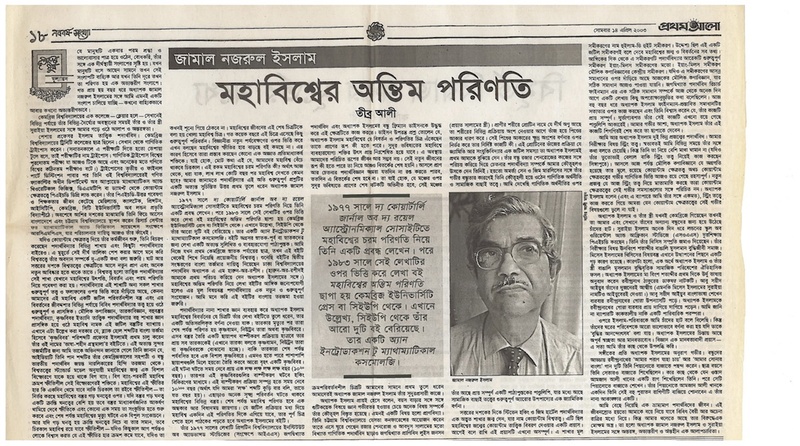 Here, as a side remark, I should mention that the word krishno-bibor which is the Bengali term for a black hole was first coined by Professor Jamal Nazrul Islam in his popular book on the subject in the Bhasha-Shaheed Grontho-Mala (“The Language Martyrs Book Series”). When I congratulated him on this fine choice of words he told me that he got the idea from the Hindi word for black holes which had been coined by his long-time friend and Cambridge-era contemporary Jayant Narlikar, the famous Indian cosmologist. According to the standard model of cosmology, the universe started its life in a massive explosion known as the Big Bang. The universe continued to expand after the big bang thanks to its impulse. Whether the universe will expand forever or not depends on the average density of matter in it. If this average density is greater than a critical value then the gravitational attraction of matter will eventually put a stop to this expansion and the universe will start to contract, and will meet its demise in the so-called Big Crunch. However, if the density of matter is less than or equal to the critical density, the universe will forever remain expanding — and until recently, people believed that this rate of expansion will decrease although it will never reach zero. This scenario of an ever expanding universe is known as the open universe. In the last few years there have been some important changes made to this picture. Based on new observations, scientists have concluded that not only is the universe expanding, its rate of expansion is increasing. They have concluded that the cause of this accelerated expansion is some antigravitating force whose origin is not yet understood. In short, it appears that the universe is indeed open and will go on to live forever. What is the ultimate fate of such an open universe? To my knowledge the first person to address and give an answer to this very important physical question was Professor Jamal Nazrul Islam. In 1977 he published an article on the ultimate fate of the universe in The Quarterly Journal of the Royal Astronomical Society. Later, in 1983, he turned that article into a book titled The Ultimate Fate of the Universe published by Cambridge University Press (CUP). Incidentally, he has two more books from CUP, one of which is An Introduction to Mathematical Cosmology. This later book is a wonderfully written textbook suitable for advanced undergraduate or graduate students of physics. When I first went to Cambridge as a graduate student I learned the necessary cosmology from this book. I have heard that Professor A. M. Harun ar Rashid of Dhaka University is going to translate the second edition of this book into Bengali. (It was Professor Harun ar Rashid who introduced me to Professor Islam.) Coming back to The Ultimate Fate, although the book is written in the format of a popular science book the main idea contained in it is a non-trivial addition to theoretical physics. It is my opinion that The Ultimate Fate ought to be translated into Bengali. Here I shall attempt to give a summary and a simplified version of the future evolution of the universe that Professor Islam presents in his book drawing on the results from many different branches of physics. When all the stars in the galaxies eventually die out they will each become one of the following three: a brown dwarf, a neutron star or a black hole. A galaxy made almost entirely of such ‘stars’ (here by a ‘star’ I mean one of the three final states mentioned above) will eventually lose most of its members through a process of evaporation. The stars that are left will eventually collapse to form a supermassive black hole. It may also happen that several such neighboring galaxies will merge to form an even bigger mega-black hole. The time scale required for this to happen would be about 100 million million million years (10^20 years). Eventually even these supermassive black holes will evaporate through Hawking radiation. It’ll take about 10^100 years (i.e., if you say the world ‘billion’ eleven times after 10, that many years) to complete this evaporation process. Beside these processes there will be many other subtle processes happening to other physical systems over these time scales. In the end, however, the universe will become a dark and dreary place. To get a full picture of the complex and intricate processes that the universe will go through to reach that fate one will have to read the whole book by Jamal Islam. His 1977 article inspired his friend and the famous physicist Freeman Dyson of the Institute for Advanced Study (IAS) to work on this field. Dyson raised the further question that in a universe, as predicted by Jamal Islam, what are the possible forms that life would take? You see, in that far future of the universe the free energy necessary for life will become an extremely rare commodity. In such a universe life as we know it will no longer be possible. The forms that life would have to take in order to survive in such a universe is still an open question. The fact is until we are able to figure out the physics of life and consciousness the debate will remain unresolved. However, the evolving backdrop against which those distant acts of the drama of life will play out was first fleshed out for us in great detail by Professor Jamal Nazrul Islam in his visionary work. Professor Islam is fond of saying, always with an amused smile, that with age instead of deepening his knowledge about a handful of subjects, his interest has spread out over many different ones. One such subject is biology. In the conferences that he has organized in Chittagong, besides distinguished physicists like Abdus Salam and mathematicians like Roger Penrose, he has had famous biologists like Louise Johnson (late Salam’s wife) come and give lectures. Proteins, which are long molecules which reside inside the body of every animal, get folded into compact forms before they can take part in various biological processes. The function of each protein depends crucially on the details of this shape. It was from Professor Islam that I first learned how this protein folding process is a non-trivial problem of geometry and combinatorics. By introducing me to the work of his friend Roger Penrose he also got me interested in the physics of consciousness. Perhaps due to his deep friendships with Amartya Sen and James Mirrlees, he became interested in mathematical economics and social choice theory. I have seen that he has an unpublished manuscript of a textbook on mathematical economics and it contains a geometrical description of Arrow’s theorem of social choice theory. In the seventies, Stephen Hawking and Jim Hartle pioneered an incredible branch of physics known as quantum cosmology. It was an attempt to give a quantum mechanical description to the origin of the universe. I should hasten to add that this attempt has so far remained unfulfilled. The central equation in this field is the Wheeler-DeWitt equation. The aim of this effort was that this complicated equation would describe the birth and evolution of an entire universe. In its form this equation is very similar to another very important equation in physics: the Yang-Mills equation. This latter equation is the central equation of particle physics. Although all of particle physics is based on approximate solutions to the Yang-Mills equation, the exact solution to this equation has not yet been found. Many years ago, the famous physicist Richard Feynman set down in a paper some intuitive ideas regarding an exact solution to this equation. For many years now, Professor Islam has been working on verifying Feynman’s ideas and he believes that the work is almost complete. Unfortunately, that work is still in manuscript form. It is one of my deepest hope that Professor Islam would finish this work soon and publish the results. Professor Islam and I are physicists from different generations. My field of study is string theory. Naturally I have tried to talk string theory with him at various times. But he doesn’t think too much of string theory (although his nephew Belal Baaquie works on string theory in Singapore). The fact is all the progress made in elementary particle physics till today have been facilitated by quantum field theory, but so far the mathematical foundations of quantum field theory has remained mysterious. The new generation that is so enthusiastic about string theory isn’t really familiar with these unresolved issues of quantum field theory. Professor Islam’s take on this is (and I tend to agree with him) that one shouldn’t get wrapped up in string theory at the expense of ignoring the deep issues of quantum field theory. I have seen that whenever Professor Islam and his wife Suraiya Islam visited Cambridge it always became a joyous occasion for their friends there. For some time now Suraiya Islam has been a distance education Ph.D. student at the School of Oriental and African Studies (SOAS) in London. She has even submitted a draft of her thesis. Her field of study is the Bengali Muslim intellectual society of the nineteenth century. I have a deeper reason for bringing up the topic of her thesis: in a sense both Professor Islam and his wife are natural products of that historical Bengali Muslim intellectual social milieu. In the early part of the twentieth century Professor Islam’s mother had translated Rabindranath Tagore’s drama The Post-Office from Bengali into Urdu. The famous Tagore scholar Abu Sayeed Ayub is related to both of them (and in fact, Suraiya Islam was named by Ayub). Abu Sayeed Ayub learned the Bengali language by carefully reading and rereading Tagore’s novel Gora. I have seen Professor Islam reread Gora many times, taking notes and carefully underlying many of its parts. I don’t know if this fascination with Gora is a coincidence or a family tradition. Above I have described each visits by the Islam family to Cambridge as a joyous occasion for their friends. But I think it would be more appropriate to describe the atmosphere in their rooms as a festival of intelligence. In his thinking Professor Islam shows unusual clarity and humanism. That science is a humanist discipline – this is a truth I have learned from Professor Islam. Professor Islam has a deep passion for music. In gathering of friends he likes to sing on the piano two of Tagore’s songs, amaro porano jaha chai (“what my soul desires”) and amar shonar bangla (“my golden Bengal”). As a student he used to play the sitar. At some point someone taught him a raga by Ustad Amjad Ali Khan. Later he arranged it for the piano. One of his dreams is to play that raga on the piano for Ustad Amjad Ali Khan one day. I have chosen the life of a wandering physicist. It is very likely that this life will take me through trying times and many an unfamiliar night. But I have in my arsenal the most effective weapon against that night: An internal, intimate and unending conversation with Professor Jamal Nazurl Islam and Suraiya Islam. 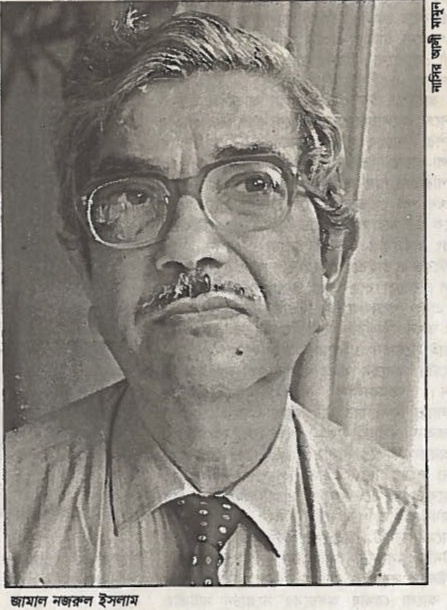 Professor Jamal Nazrul Islam worked in the Institute of Theoretical Astronomy (later amalgamated to Institute of Astronomy, Cambridge) from 1967 until 1971. Later he worked as a researcher in California Institute of Technology and University of Washington. During 1973-1974 he served as the faculty of Applied Mathematics of King’s College London. In 1978 he then joined the faculty of City University London until he returned to Chittagong in 1984. Until his death he was serving as Professor Emeritus at the University of Chittagong. He was a member of the advisory board at Shahjalal University of Science and Technology and a member of the syndicate at Chittagong University of Engineering & Technology. He also served as the director of the Research Center for Mathematical and Physical Sciences [RCMPS for short] University of Chittagong, Chittagong, Bangladesh. Such worthies who came back to Bengal to enrich its intellectual milieu inspite of having many other more ‘prosperous’ avenues to pursue hopefully will inspire other to follow in his footpath. Much respect to his decision to return to Bangladesh.